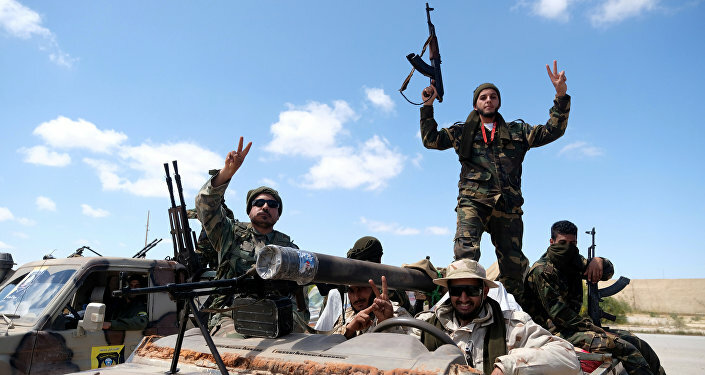 Haftar's LNA troops began an advance on Tripoli last week, striking positions of armed forces loyal to the GNA at the city's defunct international airport on Tuesday after an attack on another airport a day earlier. An official representative of Field Marshal Khalifa Haftar's Libyan National Army (LNA), Ahmed al-Mesmari, accused the Government of National Accord (GNA) head Fayez al-Sarraj of making a deal with terrorist groups, the al-Arabiya broadcaster reported. "There are alliances between the government and terrorist organisations," al-Mesmari said on Tuesday. He went on to note that al-Sarraj was no longer a politician the moment he showed support to terrorist groups. The spokesman added that GNA's head will eventually reap the fruit of his "blind support for terrorist organisations." The LNA spokesman's remarks come amid Haftar's troops' advancement on Tripoli which commenced last week; the forces struck positions of the military loyal to the GNA at the city's defunct international airport on Tuesday following an attack on another airport a day earlier. The GNA, in turn, reacted to the offensive by announcing a mobilisation of its forces. Additionally, it vowed to initiate a counteroffensive dubbed operation 'Volcano of Rage' to repel the LNA. The United Nations previously stated that the organisation would hold a conference in the city of Ghadames on 14-16 April to discuss solutions to the conflict.